Travelers from ancient times to the present used Occaneechi Gap when traveling from the Appalachian Mountains to the Atlantic Ocean. The course they took came to be called the Great Central Coast Path/Trail/Road. The gap allowed travelers to avoid a one hundred and fifty foot climb and, more importantly, provided a reasonably easy way to bypass the Eno River if one were going down to the ocean and the river was high. Or if, like John Lawson, you just didn't want to cross any more rivers. One can, without great difficulty, walk all the way from Seven Mile Ck, just west of Moorefields to New Bern without getting your feet wet because just southeast of Moorefields, near the intersection of NC 10 and New Hope Church Rd, the trail intersects the watershed between the Cape Fear and the Neuse River basins. To the right is a map showing the upper portion of that watershed. In the upper left the Great Bend of the Eno west of Hillsborough shows distinctly. 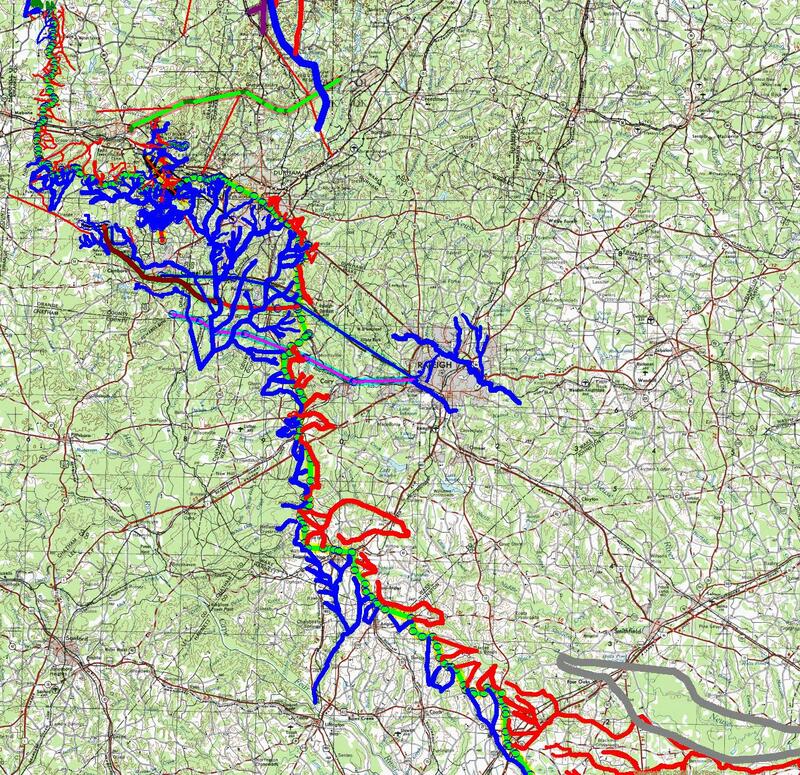 The blue lines are Cape Fear feeders and the red lines are streams feeing the Neuse. The road he had been on was a great old trading path that followed an almost perfectly straight line from Moniseep ford (about a mile downstream from Interstate 85's crossing of the Roanoke River) to the Catawba in the vicinity of Charlotte. In fact, a straight edge with one end pinned to Bermuda Hundred on the Appomattox River in Virginia and the other end pinned to the Catawba towns around Sugar Creek would almost perfectly pass through Moniseep. 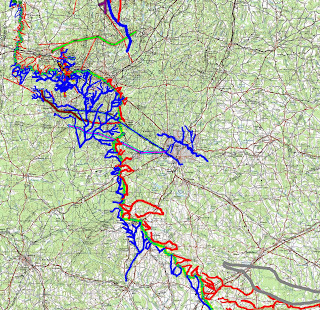 Then it would cross the Tar in its upper springs, pass the Flat River just above its forks, and cross the Eno just above the Great bend, near where NC 70 crosses it today west of Hillsborough. That straight line would then have gone to a crossing of the Haw a couple of miles upstream from modern Saxapahaw. But, if one decided to turn down country somewhere near the center of the Haw Fields, then one would have climbed on the Great Central Coast Trail. It crossed the Haw downstream of NC 54 and would have met the Lawson's trading path near Efland, NC, west of Seven Mile Creek's ford and Occaneechi Gap. Traffic traveling northeast or east that wanted to avoid the fords on the Eno around its great bend, had the option of passing through a gap south of Occaneechi Mountain. Just as at fords, several roads came together on either side of the gap. On the west side there were roads coming from the northwest (the Saura Trail/High Rock Road), from the west (Central Coast Trail) and from the southwest, the Trading Path to the Catawba. They all came together on the west side of Occaneechi Gap. On the other side of the gap, two roads from the Chesapeak met two roads from the coast and a road from the heads of navigation of the Cape Fear and the Peedee. 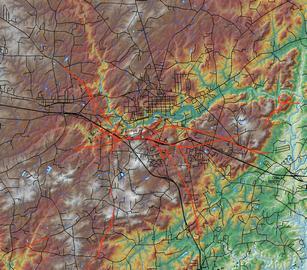 Small wonder that the gap today carries both I-85 and I-40. Whoever owned that gap and its approaches owned valuable real estate. When Orange County came into being the west end of the gap was owned by John Gray, father-in-law to Thomas Hart, god-father to Thomas Hart Benton, Senator from Missouri born just west of the Eno on the Saura Trail approach to Occaneechi Gap, close to that trails intersection with the post road to Virginia and not more than a quarter mile away from where all those wonderful trails came together on the east side of the Haw Fields. Any information that is going to be shared should be stated before you click ok so you can decide. The thing that annoys me is that you sign up and then find out your information is public before you can take it down. Very cool part of the country. Thanks for posting this map. I'm looking forward to checking it out myself this summer!